City employees, nonprofit organizations, app developers, and the public can go to the new Los Angeles GeoHub, find data, and map it. Los Angeles is famous for being an incubator for new ideas. It's where the film industry got its start, where the fitness craze took shape, and where the modern food truck movement hit the road. 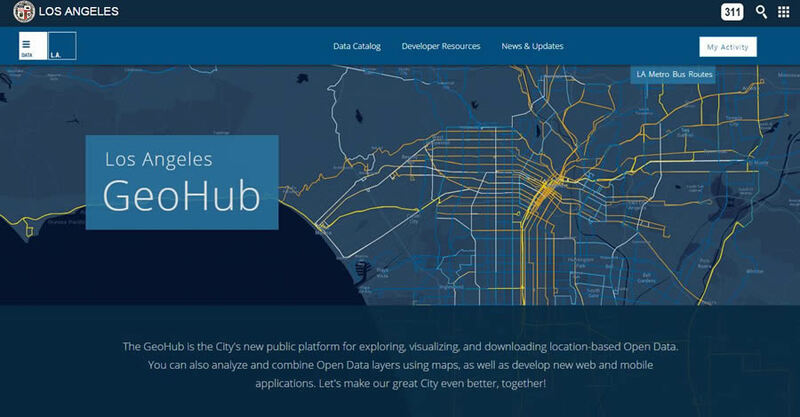 Now the city of Los Angeles and Esri have partnered on a project that should spur even more innovation in government, business, and other organizations: the Los Angeles GeoHub. Unveiled recently by Los Angeles mayor Eric Garcetti, the GeoHub gives city staff, businesses, app developers, nonprofit organizations, and the public access to the city's location-based data through an online portal. People can download datasets into spreadsheets, KMLs, or shapefiles. They can also visualize the data in the form of online maps using Esri ArcGIS. 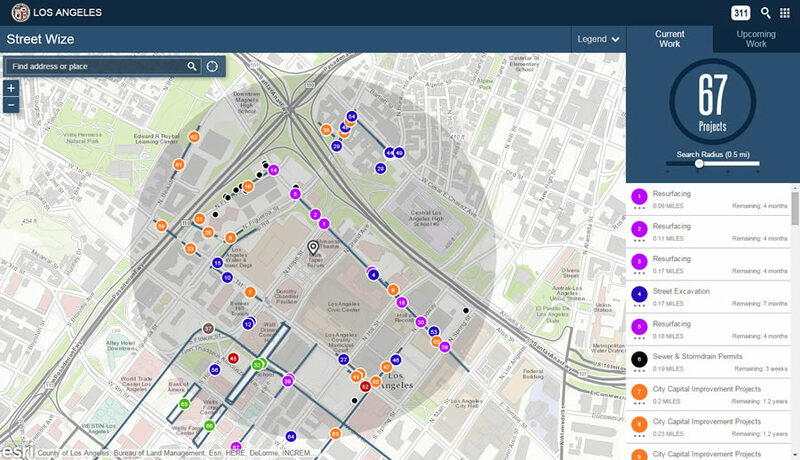 The GeoHub combines the city's geographic data into a location-as-a-service platform (LaaS), offering authoritative information, insight, and a means for stakeholders to collaborate to address goals, initiatives, and challenges. 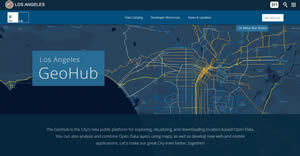 The GeoHub is the centerpiece of Garcetti's effort to make Los Angeles a world leader in open data and civic innovation. The Southern California city is in the midst of a transition: Startups are launching, the arts are thriving, and Angelenos are bubbling with ideas. Evolving, too, is the City of Los Angeles, which is poised to transform the way people, businesses, and government interact. 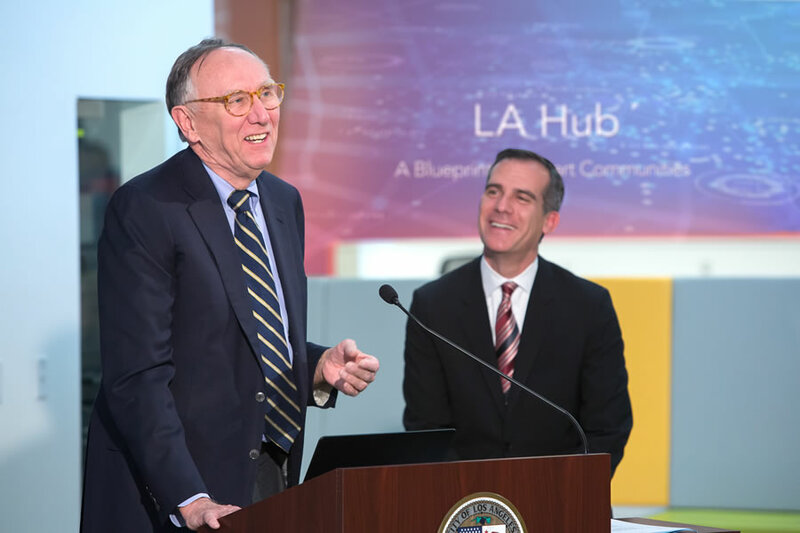 Esri president Jack Dangermond (left) joins Los Angeles Mayor Eric Garcetti at the launch of the GeoHub. By opening the city's data to everyone, Garcetti hopes to make city operations more efficient, stimulate partnerships between the city and the community, and give residents the opportunity to participate more in government. "Los Angeles is known as a place that thinks big. We are known for our curiosity. We are known for our innovation," Garcetti said at the GeoHub launch on January 29 at the La Kretz Innovation Campus, which is the city's clean technology industry hub. "[GeoHub] will help us reinvent the way we deliver services and broaden our ability to engage residents and businesses to improve the quality of life in their city." Like many municipalities, Los Angeles' city departments use spatial analysis from GIS technology to manage resources and make better decisions. While GIS is an invaluable tool for decision making, the data and services within each department are not always readily shareable. GeoHub aims to make each department's data available online in real time to boost efficiency and eliminate the information bottleneck. By connecting Los Angeles' datasets across departments, the city will be better equipped to deal with issues such as public safety and homelessness. Garcetti cited firefighters as one example of city employees who would benefit from the GeoHub. The GeoHub includes several ready-to-use mapping apps such as Road to 2400 and Street Wize. 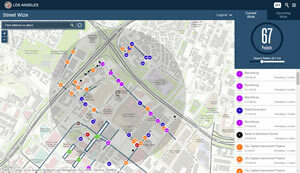 "Public safety personnel could make critical, real-time decisions based on solid map-based data. GeoHub makes that possible," the mayor said. "Let's say a firefighter with an iPad or a mobile device is called to respond to an emergency like an earthquake. Thanks to GeoHub, he or she could just pull up more than the 911 data for that call. [Firefighters] could find more important facts like building inspection status, location of the nearest fire hydrants, sewer lines, streetlights—any information that would make it easier to respond to an emergency." The story of firefighters accessing real-time GIS services represents a paradigm shift in how cities operate. At the GeoHub launch, Esri president Jack Dangermond explained how, through the GeoHub, the city's government could better serve its citizens by abandoning hierarchical decision making for a network-based approach. "I can search for maps. I can mash up [or] combine maps. I can get insights. I can make better decisions," Dangermond said. In other words, a network-based model where information and feedback can be freely shared among stakeholders—including the public—leads to democratic policy making that is better for the community overall. You can use the Street Wize mapping app to see the location of sewer and storm drain, street excavation, street resurfacing, and other projects in downtown Los Angeles. The map also includes information such as how long each project will take to complete. 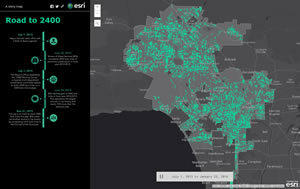 Garcetti's vision of an open data platform for the City of Los Angeles goes beyond serving the government. GeoHub aims to create partnerships between the city, academia, nongovernmental organizations, businesses, and startups. For Los Angeles, startups not only represent potential economic development but also opportunities to collaborate and solve some of the city's biggest problems. One such collaborative partnership is the La Kretz Innovation Campus, located in the heart of the city's flourishing Arts District. La Kretz is a clean technology incubator owned by the Los Angeles Department of Water and Power. It's a place where startups, scientists, engineers, and policy makers can develop energy solutions that support the city's green economy. GeoHub offers a similar opportunity for startups interested in solving issues such as reducing traffic or greenhouse gas emissions or tackling any other problem with a spatial component. Through the portal, developers can access the city's data along with open APIs they can use to build apps that they can bring to market. "[What] I've said to tech leaders is, 'Use LA as a platform; this is the best platform anywhere in the world,' " Garcetti said. "We are open for business." View the road work completed in the City of Los Angeles over time using the Road to 2400 mapping app. Open data may be old news to GIS professionals and data scientists, but for others, the concept may be relatively new. GeoHub provides a simple and intuitive user experience for searching for datasets and mapping them. The portal also includes categories of data such as infrastructure, safety, business, transportation, and recreation and parks. There are featured web mapping applications on GeoHub designed to provide transparency and empower people to take part in their government. Street Wize, for example, allows Angelenos to track current and upcoming permit and construction activity around the city so they can plan accordingly to avoid delays. Vision Zero uses a data-driven approach to reduce traffic-related injuries and deaths—with the goal of eliminating them altogether by 2025. And Road to 2400 shows the 2,400 lane miles of streets Los Angeles was able to pave on a 2,200 lane budget. Next Time You Think of Los Angeles, Think "Open"
GeoHub marks the beginning of a new era of open data innovation in government. By compiling the city's disparate datasets into a single location as a service platform, Los Angeles is breaking down the barriers that cause inefficiency to work toward becoming a smarter, safer city. With data available by way of intuitive apps, residents can play a greater role in shaping their government. And by providing opportunities for startups, Los Angeles can continue to ride its wave of high-tech innovation. 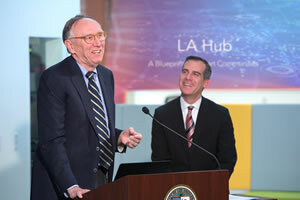 For more information, watch this video of the GeoHub announcement by Garcetti and Dangermond.